5 White Kitchens, 5 Different Looks: Got a Favorite? I have a white kitchen (inspired by Something’s Gotta Give, natch), so I’m always adding pics of pretty ones to Pinterest. Here are 5 I like, each with their own style and vibe. Which is your favorite? I keep hearing that people are tired of white kitchens, but I still love them. Do you? You’re not making this easy. 🙂 I really like the last three, but I would choose #5 as my favorite, but #4 is a close second. I like the white with dark counters in both and really like the floors in #5. The overall effect in #5 is warm and clean. …but, i do like the tile in #4. I have white cabinets with black counters, stainless appliances, but my floor is off white (tile). Pretty neutral all around. I would have wood floors if I owned. The last one is the kitchen that speaks to me. Love the bead on the ceiling and the glass front cabinets. Love, love, love white kitchens!!! Thanks for letting me dream a bit after a rather hectic day! I love #2 and #5! I love white kitchens! But my kitchen, dining room and library are all open to one another and I don’t want them all to be painted white. So when I remodel my kitchen, I’m going to paint it (and the other two rooms) and the cupboards a colour I call “pale Dijon mustard cream sauce”. My kitchen will have hardwood floors and marble counter tops. number one. NUMBER ONE!!!! easy. You had me at “blue porcelain stove.” That said, it’s really hard to choose just one! Each of them has something I deeply covet. Luckily, I can’t afford any of them anyway, so I don’t have to commit! I feel like I have been sentenced to medium or dark-toned wood kitchens for a long time. I did have a painted kitchen for about a year and a half, but it wasn’t my favourite. I have been absolutely longing to find the perfect shade of white, and make my kitchen (wherever it was I lived) bright and cheerful for years. I love aspects of each of the kitchens you’ve shown: the punch of cobalt (#1), the high ceilings, lots of windows, and gorgeous light fixtures (#2), the sink/faucet, open shelving, hits of aqua (#3), the green and the range (#4), again the windows, the sink, the island (#5). I think I like the last one the best though. I do not really like the fridge – I never keep mine clean or tidy enough to have it exposed like that. Thanks for such a fun post! I would probably pick the last one, only I would change out the light fixtures because they look too industrial for my taste. The second kitchen is a close second favorite. This was fun to decide! I would love it if you featured this kind of activity more often. I think white kitchens are timeless – I don’t see them ever truly going out of style. We’re in the middle of a kitchen remodel – stripping it down, blowing it out, changing the whole feel. And yes, we’re going for a white kitchen! We’ll have white shaker-style cabinets, black appliances, New Venetian Gold counters, a sparkly black backsplash only behind the stovetop and wall-mounted range hood, and a pale gold yellow on the walls. The only thing we can decide upon is the flooring. Hope to have that nailed down soon! Jaynee, you just described our kitchen, with the exception of the hood, we did a mantle over range and so far no back splash. We used a Armstrong vinyl wood look on the floor! Beautiful and easy on the legs for hours spent in the kitchen. I LOVE a white kitchen. I started with white, changed it to a taupe-ish gray years ago, tired of the darkness of that, and it is now back to white. https://www.talkofthehouse.com/phases-in-the-life-of-my-kitchen-part-2/ Your choices are ALL gorgeous, and I really can’t decide between 1 and 5, but I guess I will go with Joan’s in number 5 simply because it looks like a room I would actually live in…and that glass front refrigerator is to die for! Your kitchen is lovely, Kelly. Thanks for the link! I adore all of them. …have some reservations about number 4, but I’d take it! We have a white kitchen and I love it. I would consider it “casual cool”… We have pennant lights (copperish) and white appliances, aside from our dishwasher, which is stainless. I’d love new appliances, but since our work, we can’t really justify changing them just for the “pretty” factor. We still have standard white tile, but I sure would love white Carrera or black marble. Ohhh….number 5 for sure! It’s just perfect! I love a white kitchen & my favorite has to be #2. I pretty much liked all of them (the first one not so much), but like a more modern fixture and accessories and #2 fits it best although I would change it up. a white kitchen to me is so refreshing and open. I feel like I would have such a happy time cooking. I like #5 the best. I have white cabinets in my kitchen, and have the walls painted in Sarah Richardson Sapphire (SR70). It looks great! There’s not a whole lot of wall space, so the deep blue works really well. Our backsplash is white subway tile, and counters are grey. It’s a tie between 2 and 5. The other three were nice, but there were things I didn’t like about them. I adore white kitchens. I’d go for any of these but number five is my favorite of these. I love to use silver and white in my white kitchen. I have black countertops which I would never choose myself but I don’t mind them too much till I can have marble someday. Give me a big vintage stove in a white kitchen and I’m happy. Kitchen #2 had me at “big tall windows”. I love all that light and the open seating area right there, so friends can sit at the table and drink all the wine while you arrange whatever snacks they brought over and holler at them to quit hogging the wine. You could also cook dinner for the family while your kids sit at the table and do their homework. Preferably not both scenarios at the same time. I’m all vintage, all the time, and I think kitchen #2 looks more vintage inspired than the “vintage charm” kitchen, which looked more trendy to me. And I could never have a sink that faced a wall. Oh my, well…Joan’s kitchen (#5) is as warm and wonderful as SHE is! So that is a fave….but loving #2 as well, give me windows and light and tall ceilings. Pretty please, cherry on top! All of them are beautiful but number 2 is my favorite because of the tall windows letting in so much light. I also love the large open space and high ceilings. I don’t think that white kitchens will ever go out of style. It will always be a top favorite for many because of it is crisp clean look. Additionally, as you pointed out having a white kitchen makes it so easy to add other colors as accents when you want to. I like number 5. We can only dream until I hit the Loto. I think they are all beautiful but if I was to choose it would be kitchen 1 or 4. I’m dreaming again. Julia thank you for sharing as always you give us something to dream about ….. oh well you never know your luck in the big city. Regards Esther from Sydney. PS my kitchen is about the same size as no. 1 it sure would be nice if it looked like that. #2 hands-down for me but what I think I find more alluring than the white is the high ceilings. We’ve always lived in old houses where low ceilings are the norm. So #2 could be purple and orange and I’d probably still like it! We just went from an all white kitchen to yellow cabinets, keeping the white granite counters – a gorgeous smooth yellow, not a bright yellow, and it matches my personality more. Martha Stewart’s TV kitchen went yellow right after we did, so for the first time ever, I felt like a trend setter! The white was pretty but didn’t seem as happy as the rest of our house, color-wise. I’m sure when (if) we sell the house, the first thing someone will do is rip out the yellow cabinets and put in…..white! Ooh, that sounds beautiful! I love yellow, so I could get excited about a yellow kitchen. I agree–I love her house. You guys all need to click that link and visit Joan’s blog to see the rest of the kitchen (For the Love of a House). I go over there and stare at it now and then. It’s just so beautiful! They’re all nice, but 2 and 5 are my favorites. I don’t have a white kitchen. I love white kitchens, and these are all nice, although none is perfect. I like #4, with the green tiles which add a splash of color, but I am not a fan of grout in kitchens, especially such wide grout lines. I notice that all of these kitchens have open shelves and glass-fronted cabinets, which I think is great for a pantry, but not so good for a kitchen, when everything is always on display. I also notice that those commercial stoves have all their controls in a row, instead of grouped logically, which would make for continual confusion and inconvenience, and perhaps even danger. What I do admire is the spacious look made even bigger by the white color, and at least a few windows, especially over the sink. I guess what I would really like is to take elements from each of this, but then still design my own. Parnassus: Easy solution for glass-front cabinets, one we employed in our house. All of our upper cabinets came with a clear glass so we went to our local glass dealer and picked out a pattern glass. There are a million choices so we chose one that was simple so as not to take away from the cabinets, but one that had enough of a pattern to mottle the view of the bag of Almond Joys sitting next to the box of Double Stuff Oreos!! Here’s the link to the brand of glass we used. A million patterns to choose from. I like #5 the best. I redid my last kitchen in ivory & black and loved it. I now have cherry cabinets and my husband hates the idea of painting them. My wood cabinets are easier to clean because they don’t show every little smudge, I must say. Love the dog bed in #5 too. Number 5 is my favorite – but I will ‘take’ any of them! The first one is different – I like that look – not a blue fan, but I’ll bet I could change the color combo. Going to pin it, now! Ha! I love it. I can say I’ve decorated with those things, too. My kids have a playroom with a big table for homework, and my son has a desk in his room, but they always end up working on the kitchen table instead. So hard to choose! #1 has me at the blue range and #2 is so warm and welcoming. White kitchens are the best. They are a timeless classic which never gets stale. White allows the food to be the star of the show. White makes it easy to showcase colorful dishes or china. Love, love, love! I have a white kitchen and my absolute favorite kitchen is the one from Something’s gotta Give too! I love #5 kitchen from the list – it’s the perfect combination of light and dark that can make a white kitchen welcoming instead of cold and sterile. I still love a white kitchen!!! Wish I had one! #5 is definitely my favorite with those warm wood floors… love it! #5 is my favorite…traditional, warm, so inviting and you don’t need your sunglasses! I love them all but #1 is my favorite. Probably because it looks a lot like my own kitchen which I love. White cabinets, black countertop and wood floor. The walls are painted light grey to pick up the light grey speckles in the countertop. Everything else in there is some sort of pastel color! Kind of just went with what I had from my previous beige kitchen, and it works for the most part. Love this post for getting new decorating ideas, though! I love white kitchens too. We remodeled ours about a 2 years ago with white cabinets, blue glass subway tile backsplash, sand-colored granite, wood floors, and some bead board. Love it every day! I like all 5 of these and different elements in each one. Joan’s kitchen, #5, is my favorite. Love everything about it. It’s white, but still warm. The first one is my second favorite because I adore that blue stove, and I also like the compactness of this kitchen (I’ve always lived in small houses). I have a creamy white kitchen and I accent it with blue. I’ve always loved blue and white, and it’s classic. I need to replace my countertops and would love marble, but don’t think we can afford it. Our house is from the 20’s and I want something in keeping. I’m really into green right now, so #4 is the one for me! Love the green subway tiles! If it were truly mine, I’d want to change the counters to either white or stainless steel. I love #5, but I love the hardware in #3. I have a very small white kitchen that was inspired by all those old 40s movies “New England farmhouse style”. Hand wrought HL hinges and those black wrought iron pulls that were popular back then. Probably won’t win any awards but I love it. LOL! I must be a “decorating commitmentphobe” too, since I love changing my decorating with the seasons! I love my white kitchen & all of the kitchens you posted are fabulous! I think #3 & #5 are my favorites. I have pops of aqua in my kitchen like #3 along with green. I like how warm & inviting the last kitchen looks. That’s no contest. Number 4. Love those green tiles. Yeap, 4 it is. I prefer #5 the best. I just finished a kitchen remodel this spring and now I have my dream, WHITE kitchen. Love it. I, too , have heard that white is not as popular, but everytime I’d see a white kitchen in a magazine or on a website, my heart would skip a beat. I knew it had to be white. We have black appliances, a honed granite counter in a color called “soapstone green” (and yes, it looks just like soapstone), a ming green marble backsplash (also honed), and distressed hickory floors. The walls are pale green and I have decorated with jadite pieces and other green decor with a few splashes of cobalt. Just being in it makes me happy (*sigh*). Number 5 for me. Love a white kitchen. Timeless! I like #5 the best. But where’s the seating? I might have to give up cooking if I had a white kitchen. Lots of maintenance, no? Click the link to her blog and you’ll see the rest of the kitchen and seating area. I haven’t found my white kitchen to be high maintenance at all. I have to wipe things down once in a while, I guess, but it hasn’t seemed like much more work than when I had oak cabinets in my last house (that I hated, ugh). Theses are ALL lovely! I think my favorites are # 3 and #5. They remind me of my kitchen on Sea Island. White kitchens are definitely my favorite! I have a white kitchen, with a wood countertop but I have a grey composite sink as i can’t bear butler sinks – they’re too likely to result in broken plates and cups in my house as things get crashed into the sink! I have been adding colour through some Le Creuset pieces and coloured glass. So, for me, no 3 is closest to my own and familiar and comfortable but I do like the blue oven in no 1 and those stools are really lovely. However, i’d love to cook in No 4 with all that space and green tiles, fab! Love, love, love #5. Very warm and cozy. Has all the essentials, the wine cooler, beautiful countertops and flooring. Could probably do without the glass front fridge though. Would have to keep very clean, presentable. I pick #5, because it would fit right into my house. I have birch cabinets right now in same color as the #5 floor. The maple doors and trim throughout the house and beamed ceiling in family room would blend right in. I love the glass doors and beadboard walls. It is a white kitchen without the glare and coldness. I feels like it always was instead of brand new. My 4 Shih-Tzu pups would each be nudging their way into the wicker bed. Hope Maizie is doing great. White kitchens have been around for so long because they are CLASSIC and here to last! Especially in period homes, they usually had white to help make things look cleaner, etc..
Have had a white kitchen myself for over 16 years now and yes, we are needing to update a few things, but I will still create the new kitchen with white cabinets. It’s so easy to just add any color or colors to a white kitchen to make it look in season or up to date with the current color trends. If they are too cold for you, just warm them up with wood floors and color accents. Now as for the stainless steel appliance trend, I can’t wait to see them go! Too tough to choose just one. Can’t I have five fabulous houses in five fabulous locations with five fabulous kitchens? I’m between 4. and 5. I know they’re totally different but I love the contemporary-ness of 4. and the southern charm feeling of 5. All gorgeous though! I had a white kitchen with blue accents which I LOVED and miss so much. Unfortunately, we sold the house in 2006. If I ever get to design a kitchen again, it will definitely be white. It’s just so fresh and light. Last year, we lived in a place with dark wood cabinets and dark granite counters. It was like cooking in a cave. I love #3- homey, adorable, quirky! Just makes me feel cozy! We seem to be in the minority here. I’ll have to go back and take a good look at #5. Actually, I loved all of them. I am CRAZY about white kitchens. Mine is (just recently white – having had light maple cabinets). Couldn’t stand it another minute and had them painted. And the walls are now a very soft yellow. This room now feels not-gloomy even on a gloomy morning and cheery the rest of the time. Kitchen #3 is exactly as you describe it, cozy. It feels like a white terry-cloth robe and really comfy slippers. Just what I want in the morning. And in the afternoon. And in the evening. Amen. Kitchen #3 just feels like home. It’s my fave, for sure! I love number 2. I would take the colors and decorations from 3 and put it in 2 and that would be perfect! I cannot choose which one I like the best. They all have their great features. I really love that green tile backsplash. I also love the fact that you can change out accessories either with the seasons, or when you just want a change. I don’t have a white kitchen though. When we did paint our cabinets white, it always looked a mess. I guess with our teenagers, it just didn’t work. Also, cat hair everywhere no matter how much I cleaned. We went with wood stained cabinets instead (very light stain). It hid whatever they spilled down the cabinet and didn’t clean up. For bathrooms, I love white cabinets! The marble countertops are my favorite. Soapstone looks great with white cabinets. 5 is pretty much perfect. The thing that takes it totally to the top and makes it TOTALLY perfect is the in-kitchen fireplace and big windows/doors by her dining table. Beautiful, she has such an eye for that stuff! Trixie’s kitchen is my favorite, although I would love for the love of a house’s kitchen also…..it’s a toss up. 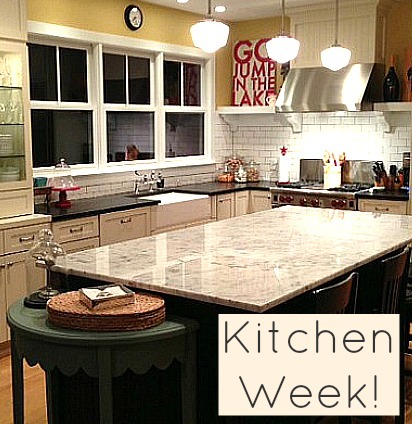 I love white kitchens….I particularly love marble ocuntertops….classic! How can that go out of style? I’m a white kitchen person, which is confirmed by all the tear sheets over the past bazillion years of kitchens – they’re all white ones! I like #1 because that is the closest to my kitchen and I could duplicate the look. I love #5 because I already know it and swoon over the fireplace/seating area. However, non have what I’d really love and that’s a layout with a big island w/seating where the cook faces them. I want people to interact with me while cooking, but I don’t want them getting up/standing/walking in my way to try to come face/make eye contact when talking. So a large island with seating that has a chopping/cooking area facing seated people is my ideal. That and dishwasher on the left b/c I’m right-handed. Yes…I know. I’m all about function AND the pretty! Well a girl can dream can’t she? While I must say I lust after that blue stove in the 1st one, the 4th one wins my heart. I actually have a VERY similar plan for the kitchen in the home I just purchased last week! The butcher block mobile unit, black countertops… gorgeous! Number one is my favorite, because of the dark counters and the stools at the counter. I’m a messy eater and clumsy cooker; there would be no rest for me, constantly wiping up in those other all-white kitchens! These are gorgeous kitchens, all of them.. I have been a kitchen designer for the past 24 years and I have seen the pendulum swing back and forth from white to wood and back again to white. White is timeless and classic with endless options on the details. I designed a white kitchen for our tiny lake cottage and I love it. Here is a link if you have a moment to look…. I do not see any signs of white kitchens having peaked. I think they are here to stay. 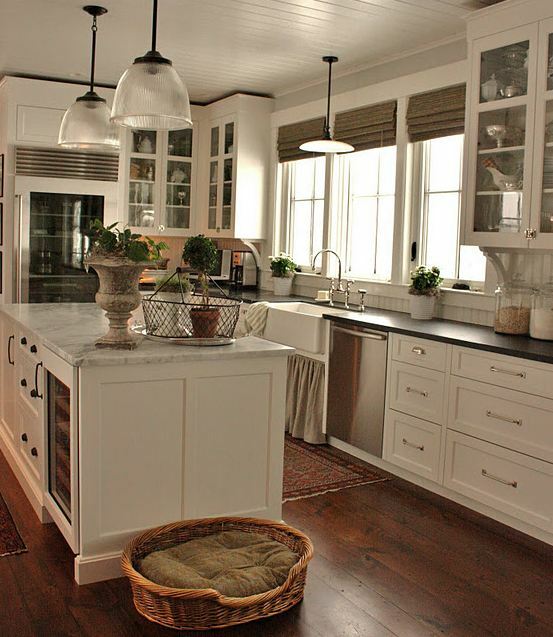 #2-love the white cabinets, marble counters and tons of sunlight. #4 is my second fave, with the green tile and black wall, it’s cozy and green is my fave color. I am a sucker for kitchen #3. Love how clean and simplistic- yet rustic it looks. I could live in that kitchen! #5 is beautiful and warm, but I love #2… those windows, that banquet, & those ceilings…although it’s obviously huge , and I’m not sure about the layout ( I might have to wear roller skates to get from that sink to wherever the stove and fridge are), I like the classic elements anyway. I have lived in many homes, with both dark and light kitchens, and my favorite kitchens have been white. I loved white kitchens long before they were “it” and painted mine white when the Tuscan-style dark was all the rage (I live in AZ). My real estate agent neighbor walked in years ago and said, “Oh no, you painted your cabinets. Your house will never sell,” but I didn’t care. I still live here, and I still love them (and two more neighbors painted theirs white this past year, so I feel vindicated)! haha White kitchens feel “clean” to me and, I’m like you, I love that I can add pops of citrus colors in the summer, warm colors and textures in the fall, and lots of festive colors during the holidays! White might not always be on-trend, but I agree with others that they are “classic” and will never go out-of-style! I too have a white kitchen and I love how I can change out colors for Spring (pastels), Summer (green, orange, and yellow) , Fall (orange and black), and of course, Christmas in green and red. I just think white kitchens are classic and will never go out of style. My favorites are 3, 4, and 5 because I do like some color instead of all white! I totally agree – you can change them to fit the seasons easily – good point! I love things about each one, but couldn’t pick one as being perfect for my taste. White kitchens can be very nice if they’ve got some warmth from accessories or a nice wood floor or counters. Number 2 seems kind of sterile white to me. Our kitchen is “unfitted”, which I really like, has a fireplace, and has cream colored walls and red and blue-green trim with a wood floor. It would be okay in white but not as fun. I liked # 2 and # 5 . ( all were beautiful ) I have cream colored cabinets and Beligan bluestone countertops the look is very similar . I agree with other posters the look is timeless. I also loved everyone who posted pics of their kitchens also. Very pretty! i have a galley kitchen with oak?? cabinets. They were sprayed with lacquer and it is flaking off. I want to paint it white. I have read that there is a paint that you use instead of sanding and then painting. Has anyone used it and does it work? I would like to do as little work as possible since I’ll be doing it myself. That’s interesting. I don’t know what the paint is, but I bet if you went to Lowe’s or Home Depot and asked someone in the paint department, they would. Good luck! While I love all the kitchens and absolutely adore kitchen #2 I must confess to be very happy with #5 ;)! I am so honored to be included in this post Julia, thank you so much. It’s funny about the the glass front refrigerator- people always think you have to keep it clean, but because the glass has a slight tint to it I swear you can never see whether is is messy or clean! It almost becomes a non-player visually. I have always had white kitchens, even before the trend, and expect I always will; they just seem happy and clean to me. I think they are a true classic. I imagine people who follow “trends “will see it as out one day as I just saw an article in the WSJ that stated marble was out for “trends” too…. someone might want to inform the French who have been using it so beautifully for centuries!! I vote they are classics! Number 2 is my dream kitchen, hands down, no holds barred, though I do prefer a tile or stone floor whenever possible in a kitchen as one of my uncle’s family is in the tile business, so I’ve been well educated on the benefits over hardwood in wet spaces. #2! I feel like I’m watching Project Runway or House Hunters and I’m trying to yell at the TV to tell them the right answer. #2 I say, #2!! Funny you mention it! I just posted our kitchen re-do….in white! :)! #5 because it is also usable space. I love white kitchens…timeless, in my opinion. I have one myself. I remember the first time I stumbled onto For the Love of a House blog, I went through every single post. I covet her kitchen. So number 5 is true love and so is the entire house! #1 and #2. That blue stove in #1 is STUNNING. #2 is beautiful – but something is “off” – why are the 2 chairs in the middle of the kitchen like that? Since I’m back and forth to the sink 100 times a day, I feel like I’d knock into them. Also – the little sink on the island has the facet sideways which is annoying me! LOVE a white kitchen and I don’t know anyone who has one anymore. My kitchen is white and I’ll never change. What I love so much about your blog is that I can start to see what I’m draw to. In #1 and #2 both use white subway tiles on the walls… so maybe that is a good choice for me! That’s funny–I hadn’t even noticed the faucet until you mentioned it, Stephanie! Love the second one!!! Great kitchens! I love parts of each kitchen. Since we have a kitchen with black counters and white cabinets, I am partial to contrasting colors or tones but we also have mixed in some brown and black in the back splash, have a wood floor, dark bamboo shades, etc. I think the wood tones warm up the black and white a bit . Each of the kitchens you’ve shown are lovely, though! I definitely am one to prefer natural wood finish with the cabinetry, I still think white is nice. I find it overkill when everything is white though; I love the use of the green tile in the one kitchen. I do, however, prefer a skinnier tile. I quite like kitchen #5 though. I love the floors in #2. It’s lovely! Thanks for the link! #5 is my favorite and my second choice would be #4. I already have the white cabinets and dark laminate floors and really like the choice of blinds over the sink and the dark counters. It has a warmth to it that I find the all white doesnt. As far as #4 I love the punch of green tiles, it makes it a statement. The all white feel cold to me and I believe a kitchen should feel welcoming, and I dont think I would be able to spend the time to keep it so spotless! i like #2 but i love#5 – the dog bed. I love #5! I agree with Joan’s comment. White is happy and classic. I have always had white kitchens and never tire of them. We just purchased a white four oven AGA and I am designing my kitchen remodel around it! Cant wait!! Wow..I like them all but I give credit to the one with the bold green subway tiles as that took some guts! I recently did an all white kitchen and love it. I disagree about it being high maintenance. Now I can actually SEE the smudges on the cabinets and can easily wipe them off. With my wood cabinets, not so…goodness knows how dirty they probably were after all those years! #5, It’s the most inviting kitchen out of the five, I think. I love love love the old style sink, and the floors! 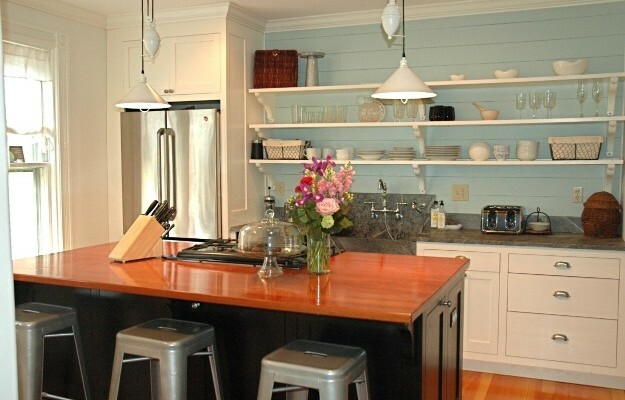 The ceiling and beadboard back splash are also things that sold me on this kitchen! ? 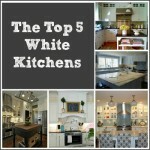 My favourite would have to be Kitchen Number 5… Oh I adore white kitchens! I live in a cottage in London with a tiny kitchen, that I have decorated white with oak counter tops, so it’s fresh, classic but with warmth! Number 5 (except for the fridge). I have an A&C bungalow and I’m seriously wanting a white kitchen. Mine is galley style and visible from the dining room; I think that the contrast with the natural woodwork in the rest of the house would be lovely. I also like the idea of the single contrast color in #3. I love that aqua, or a ‘thirties green’ might be fun…. So many good ideas – pining some of them. I like #5 and #4…. for what it’s worth. These designs are awesome I like the 3, 5. I am really impressed by your post . Thanks for sharing…..
I’m usually for modern and futuristic designs when it comes to kitchens, but I love the fifth one. The wood with the black accents are a great contrast with the white cabinets. For some reason, I like the one with the green tiles. Green is not used as much in kitchens, so that’s probably why I’m more attracted to it. 2!!! They are all gorgeous and I love the blue stove in #1 but all white kitchens look so beatiful.